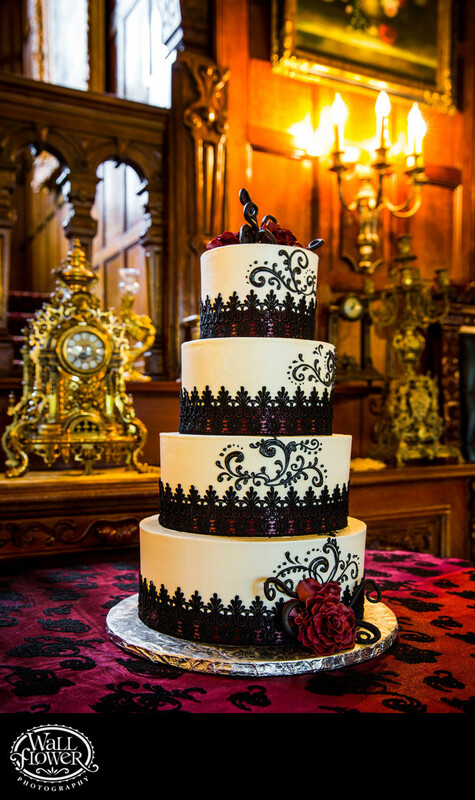 This intricately decorated wedding cake by Celebrity Cake Studio perfectly matched the wedding's theme of rich red tones and black detail. The black icing was all piped by hand, and the flowers on the cake are also edible. The cake is positioned on a table in the Great Hall of Thornewood Castle in Lakewood, Washington, near Tacoma, and you can see the railing of the oak staircase and some antiques on a sideboard in the background.